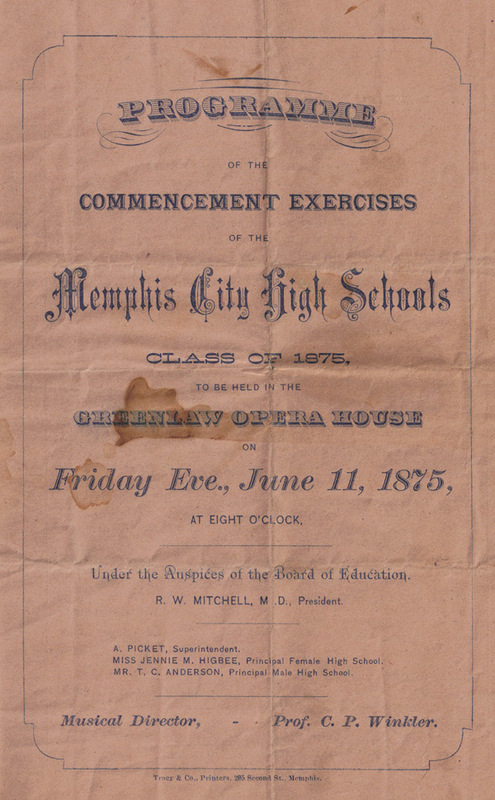 Prior to 1877, there were different high schools for male and female students in Memphis. 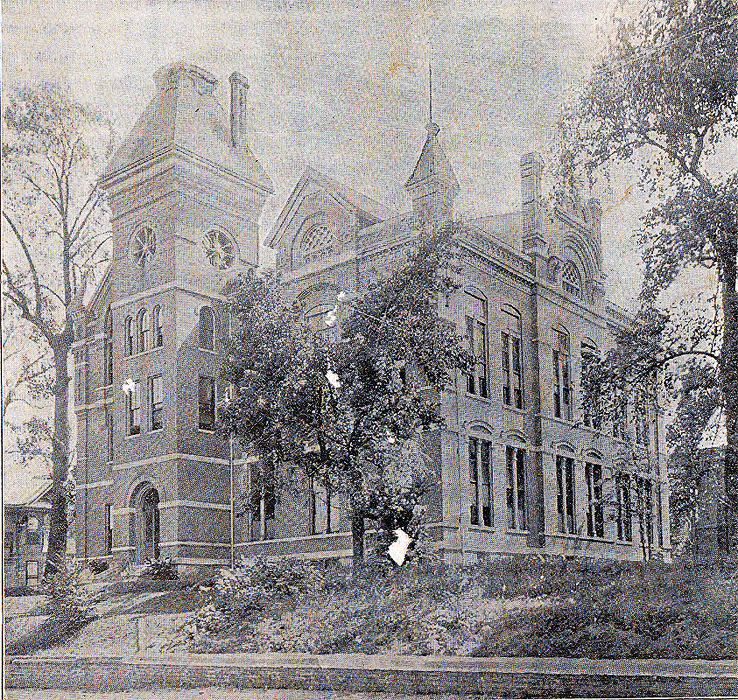 The male high school was at 300 Adams and the female high school was at Court and Third. 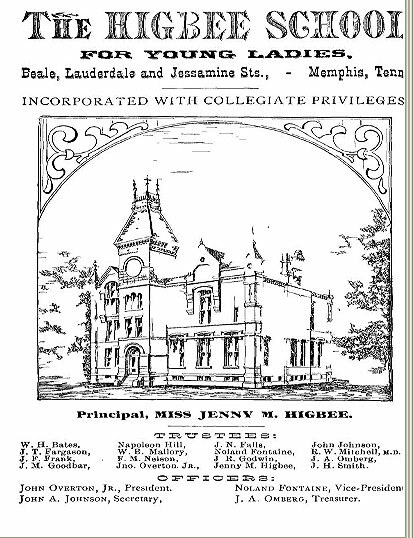 Miss Jenny M. Higbee was for ten years principal of the Memphis Court Street Female High School. 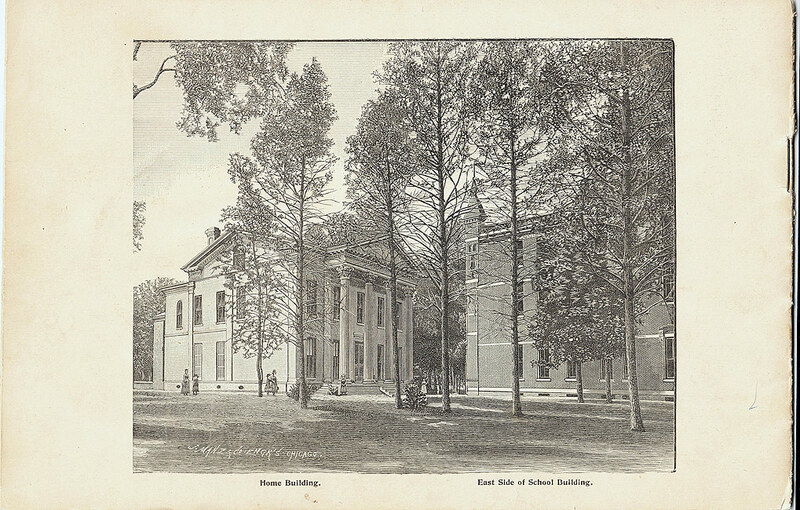 and in that capacity did much to elevate the standard of the public school system of Memphis. 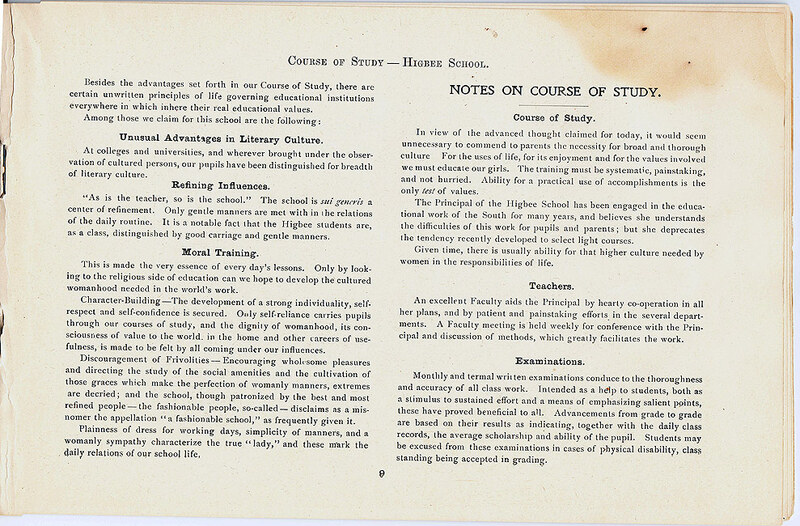 In addition, she took a stand for the higher education of women when this idea was very new...and it became the consuming theme of her life. 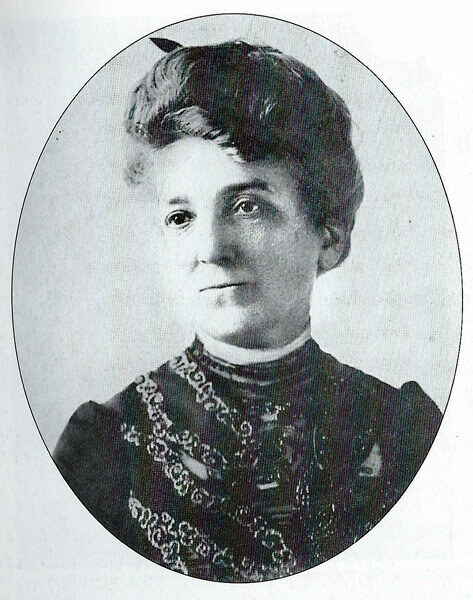 Jenny M. Higbee was born 1839 in Moorestown, New Jersey. 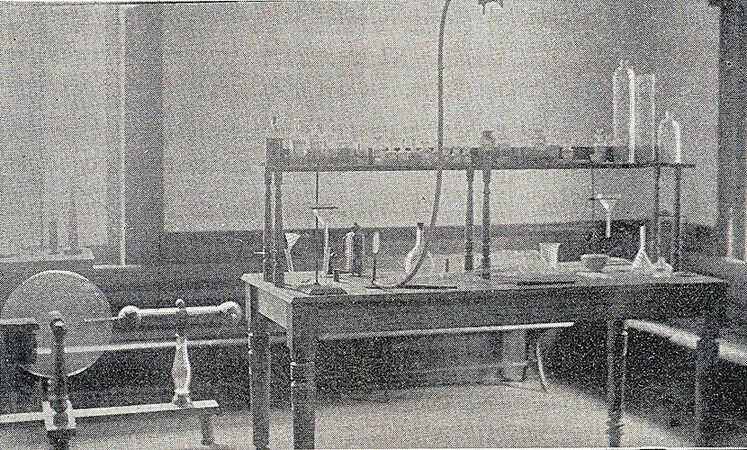 Her father was a noted physician and her mother a "cultured woman". 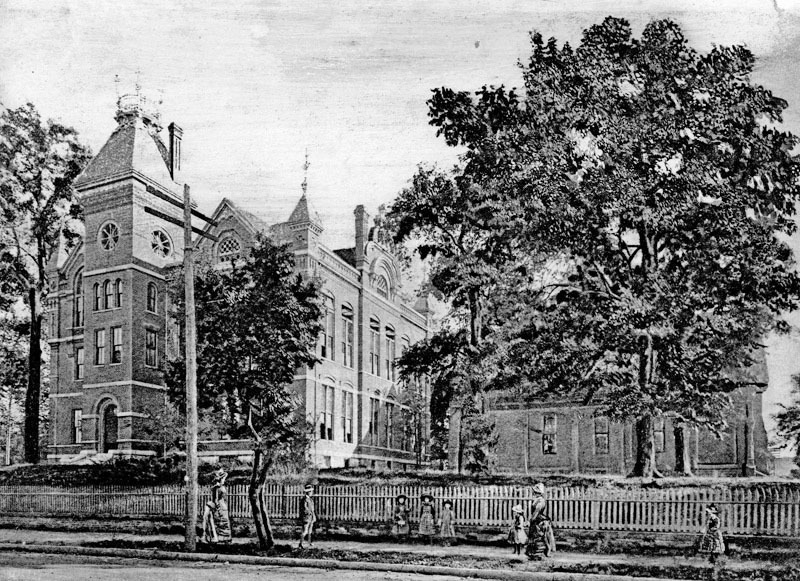 Jenny had attended a well-known female seminary in Moorestown, where teachers described her as a "genius". 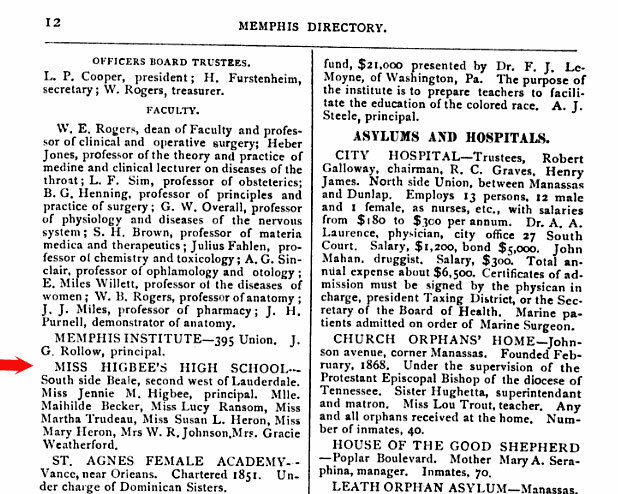 She came to Memphis toward the end of the Civil War, to live with her physician brother. 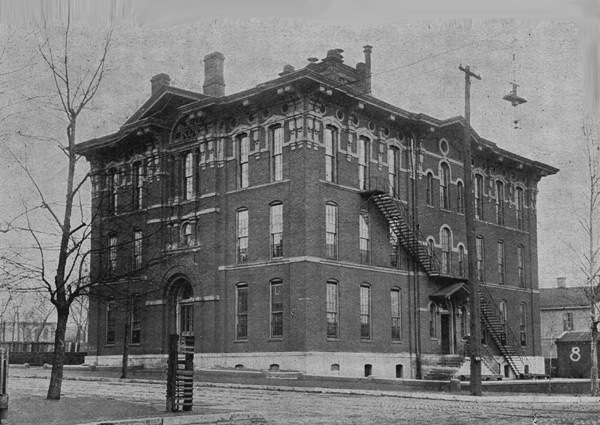 In Memphis she began teaching in the public schools at St. Mary's School, and soon became principal of the Court Street Female High School. 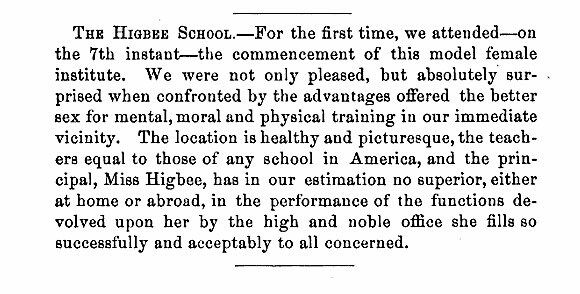 Higbee was described as "strong, energetic, and progressive" and she played an important role in the initial stages of women's education. 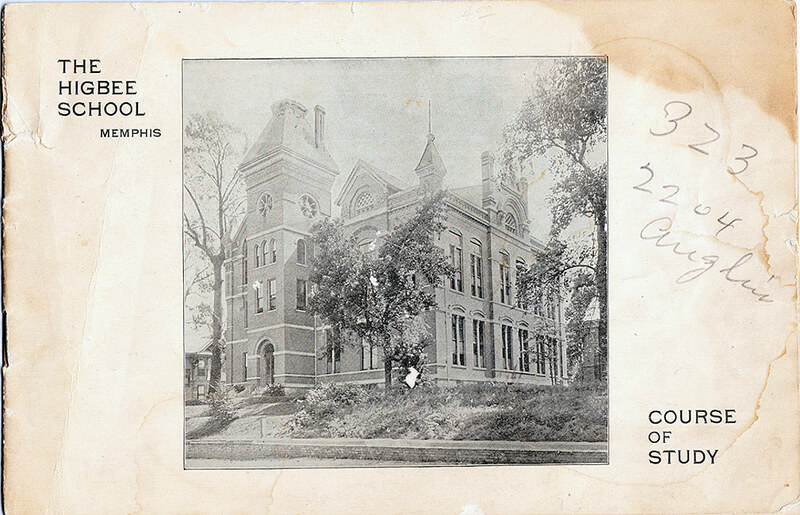 She was principal of the Court Street Female High School at the time the equal wage controversy erupted in Memphis. 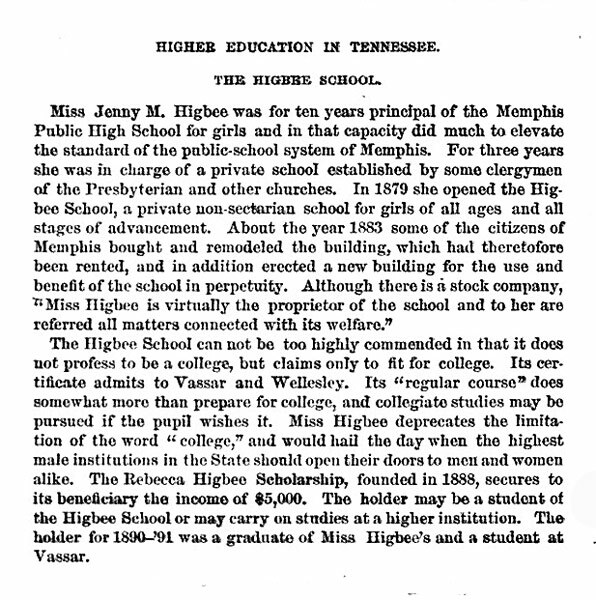 Miss Jenny took a stand for the higher education of women when this idea was very new...and it became the consuming theme of her life. 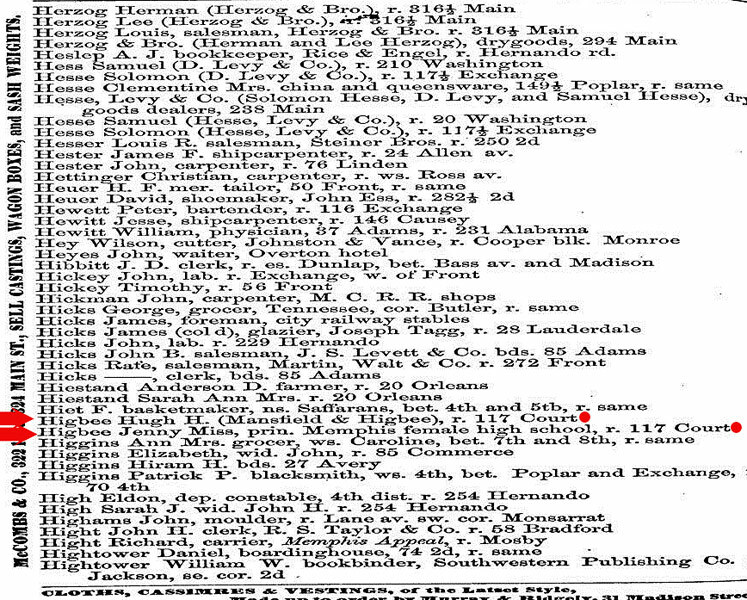 Quite a number of the current public school teachers in Memphis had received their training under Higbee and she presented the school board with these numbers. 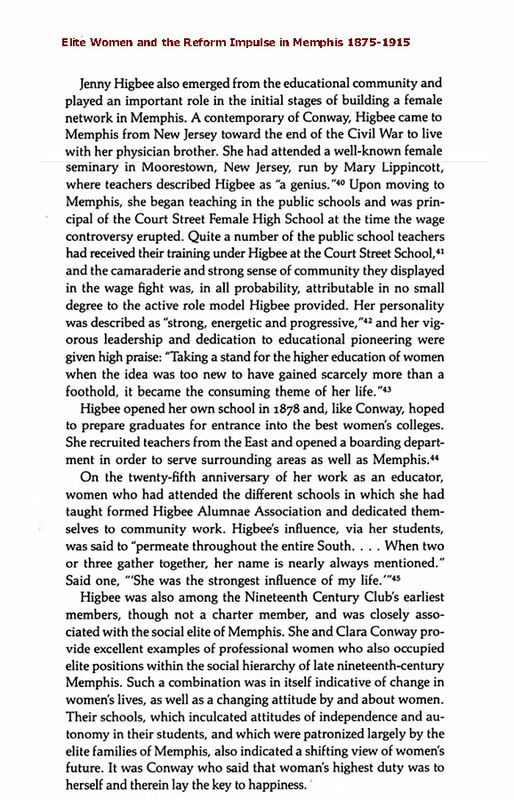 This, and the teacher's strong sense of "togetherness" showed the public the value of women's education as well as the role model Jenny Higbee had provided. 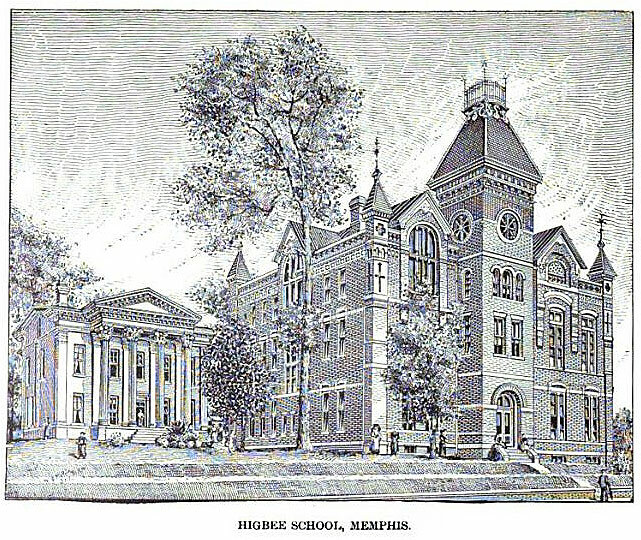 Memphis newspapers began calling the male high school "Memphis High School" and eventually the two separate high schools merged into the "Memphis High School". 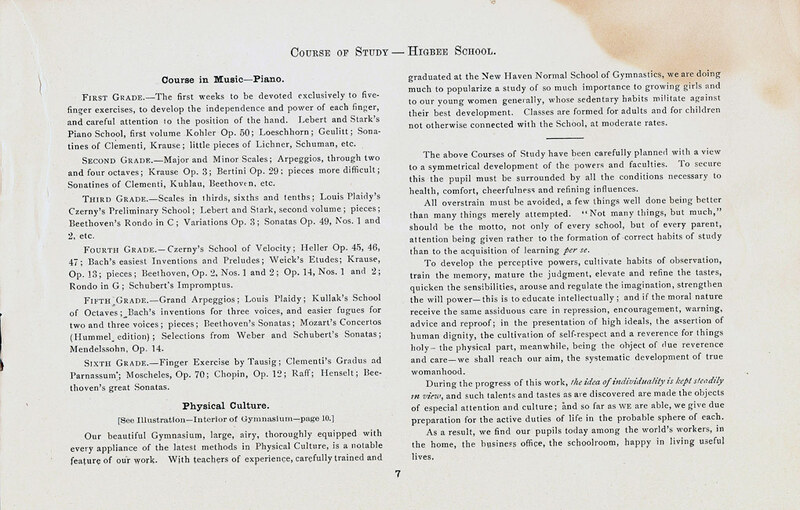 In 1875, it was thought by her many influential friends that Jenny would now be most useful as the head of a school they were establishing, which was called the "Presbyterian Grammar and High School". 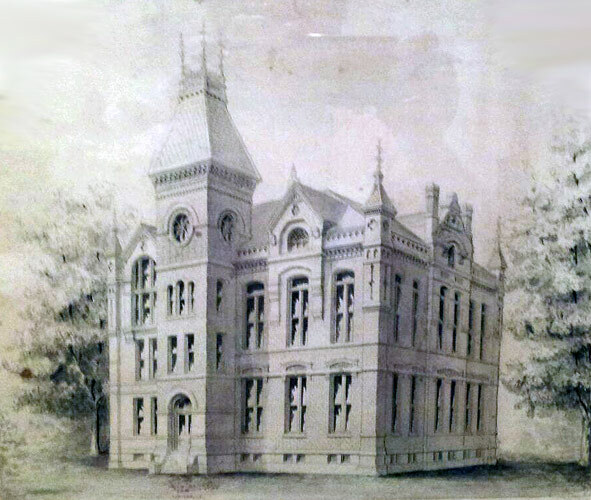 After conducting the school successfully for 3 years, Jenny resigned and opened her own school in the St. Mary's Building on Poplar but within a year she needed to move. 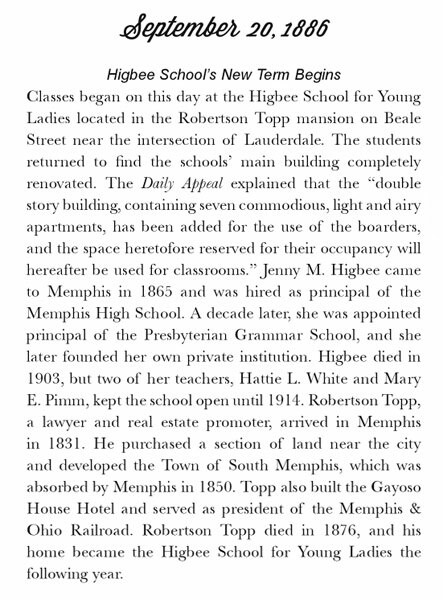 The Robertson Topp mansion on Beale was the original Higbee school, It had been built by Topp, who also built the Gayoso Hotel and developed South Memphis. 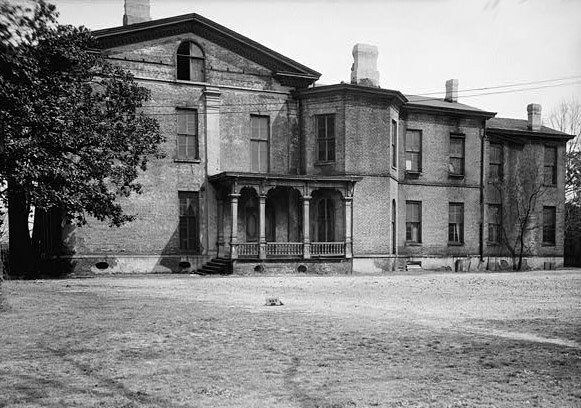 When Higbee's new school building was built next door to the mansion, the large Topp Mansion became the perfect dormitory for the Higbee School. 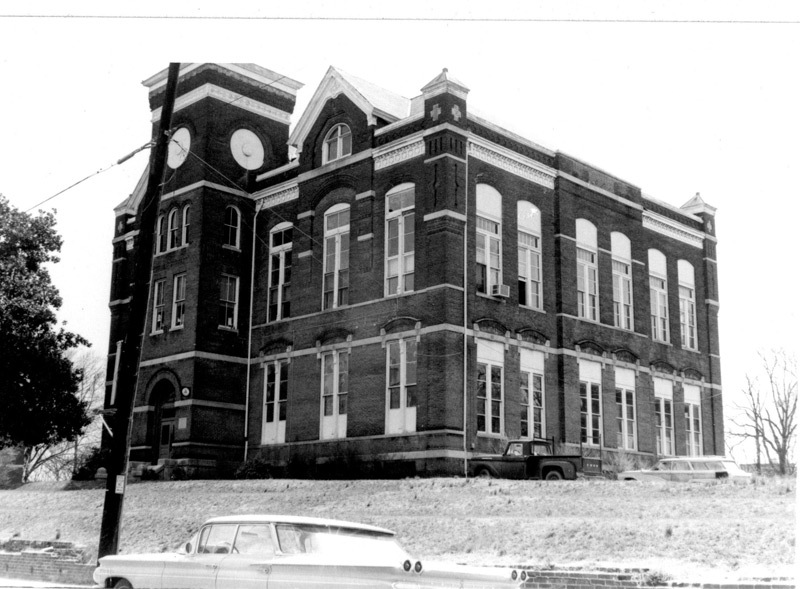 The new Higbee School building was now at the intersection of Beale and Lauderdale. 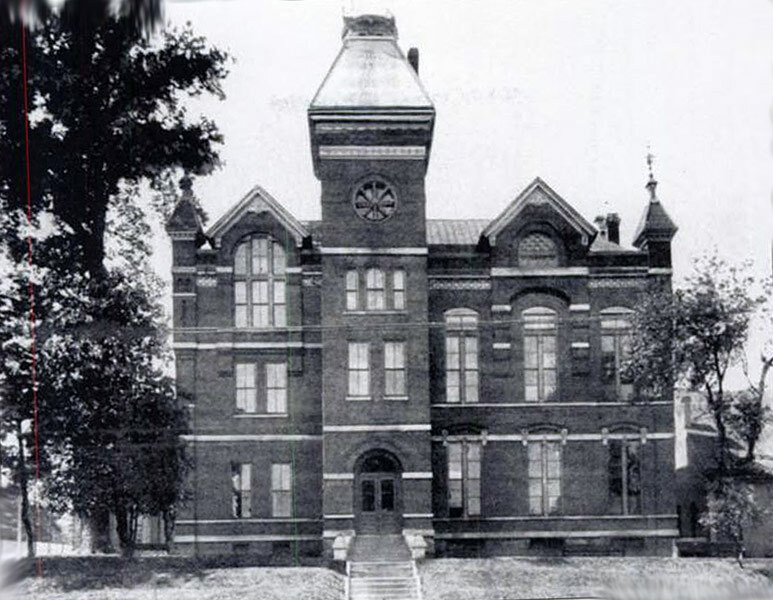 It was a three-story brick with seventeen rooms devoted to study and recitation. 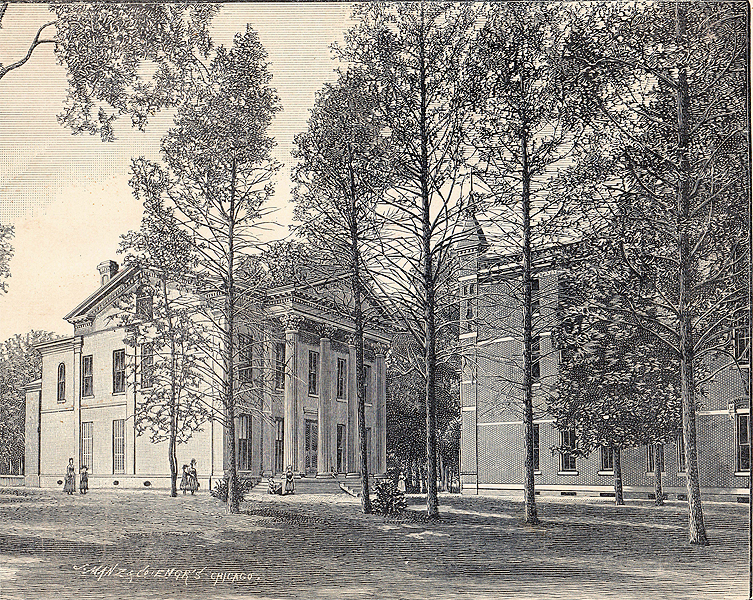 The grounds were beautifully shaded with oaks, elms, and magnolias. 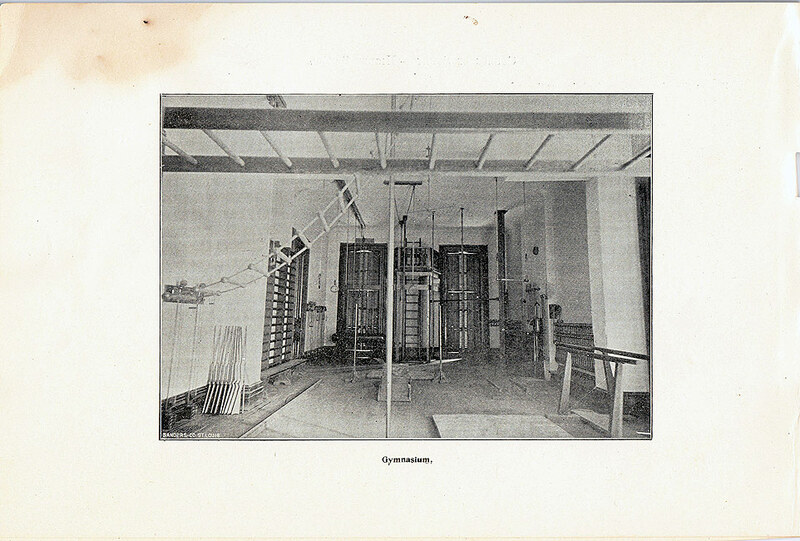 It was said to be "an imposing structure and well arranged to meet all requirements". 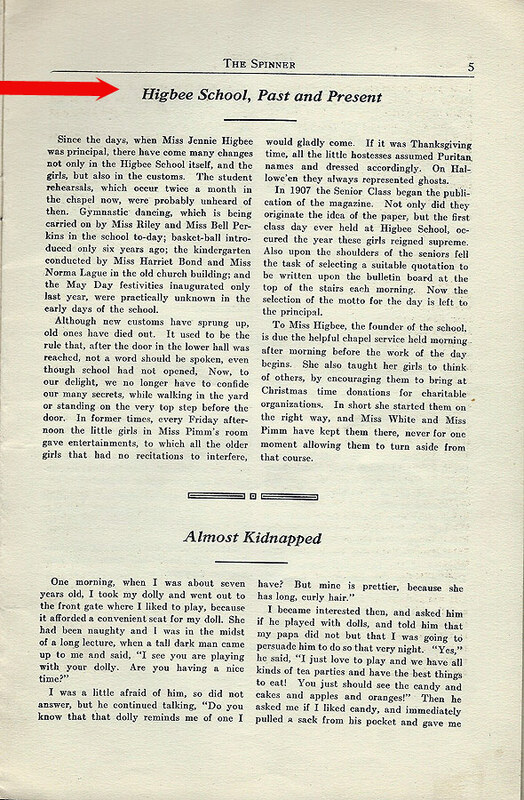 The school continued to expand and became one of the best girls' schools in the South. 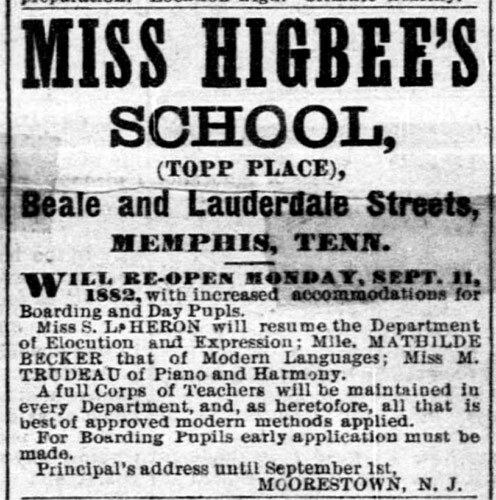 Miss Higbee, in addition to being an excellent teacher and school manager, proved to be an outstanding business woman. 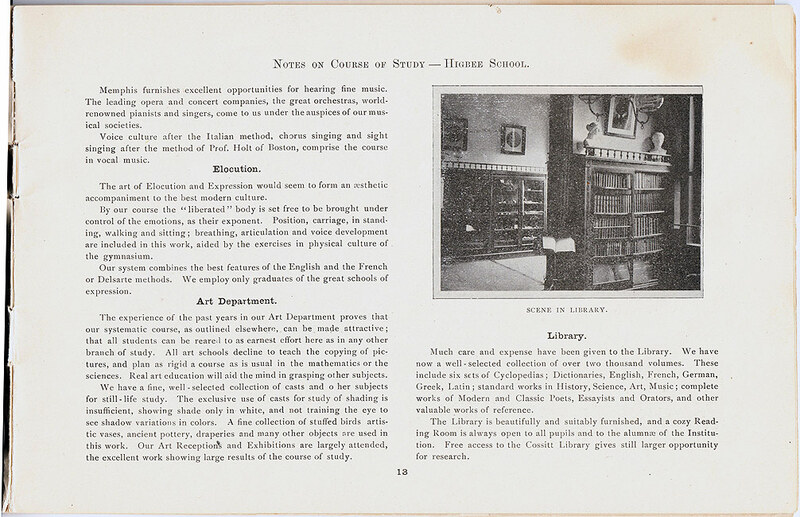 The courses of study included English, natural sciences, literature, ancient and modern languages, music, phonography, painting and wood carving. 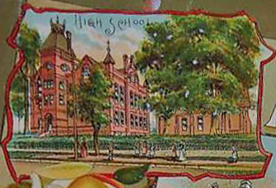 The motto of the school was "Not many things, but much". 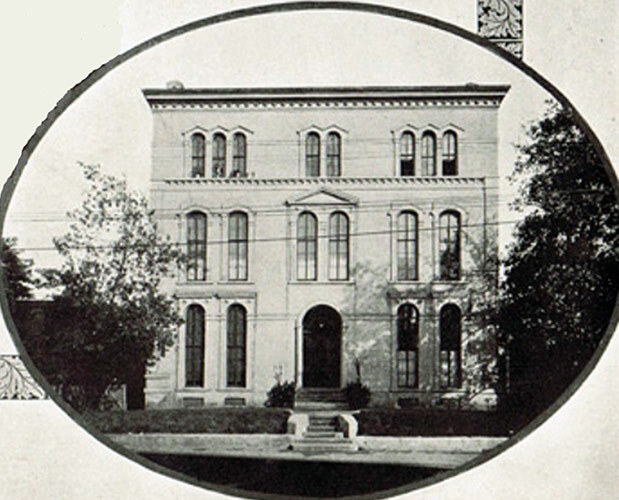 The school quickly became one of the South's leading institutions for young women. 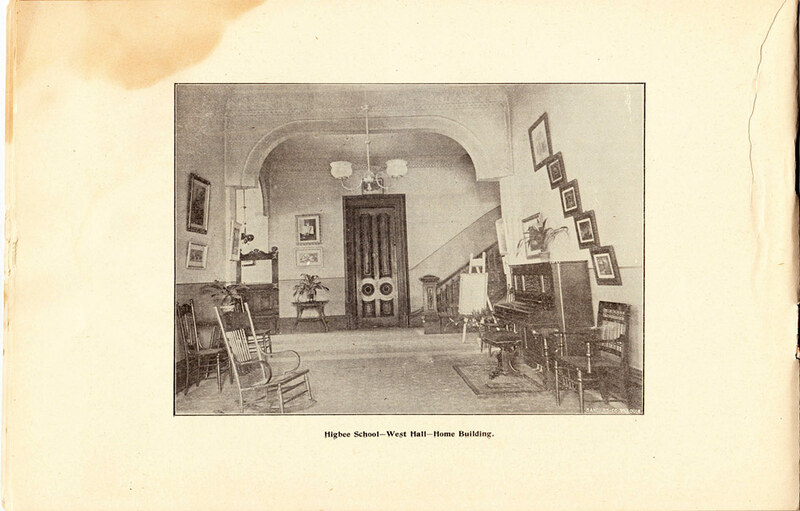 It was a "preparatory" school - to educate one or prepare them for entrance into the best women's colleges. 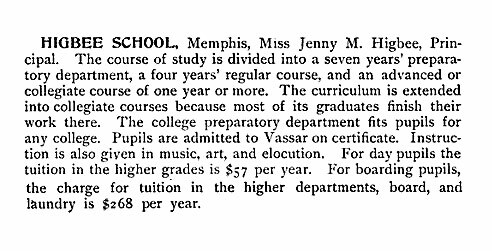 Miss Jenny's school and teaching methods became so well known that a certificate from the Higbee school automatically admitted one to Vassar and Wellesley without an examination. 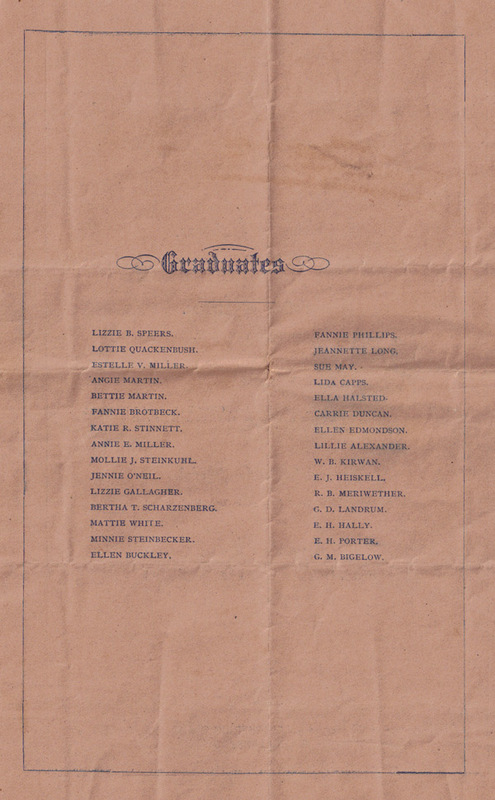 By 1892 the school had more than 300 students, and a faculty of 32. 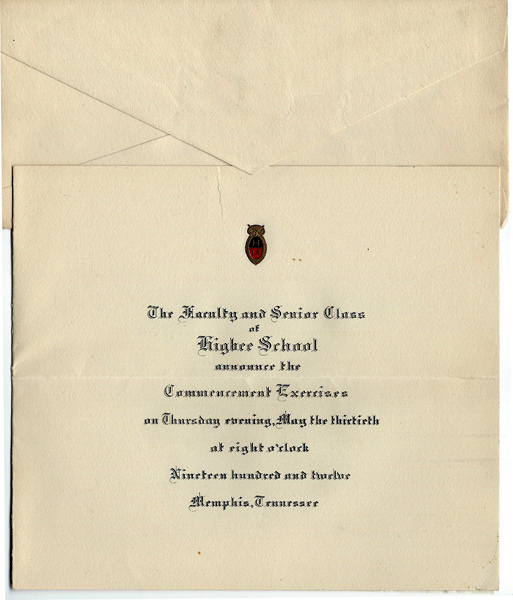 The students were as "young as kindergarten and as old as college preparatory". 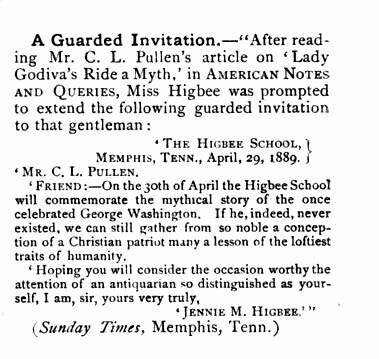 Higbee was justifiably described as "a remarkably fine teacher'. 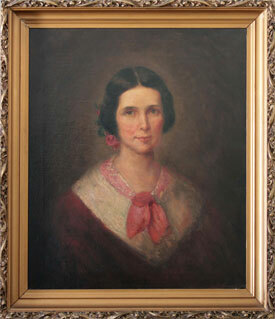 Her influence was said to be so strong as to "permeate throughout the entire South." 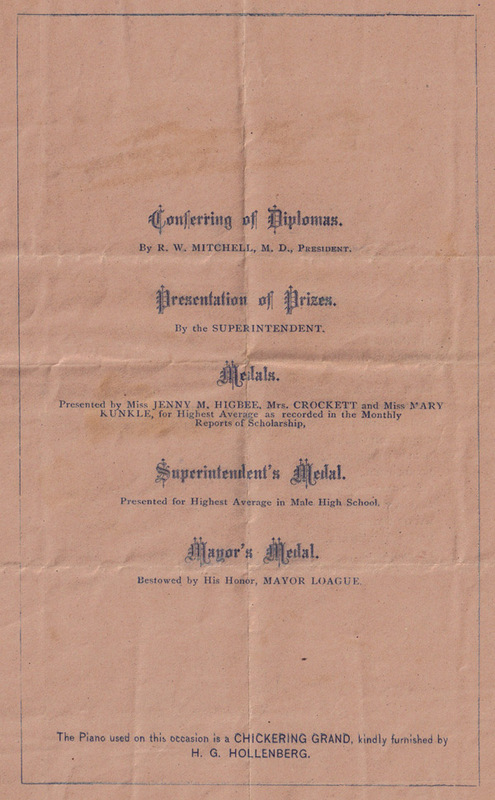 For day pupils, tuition in the higher grades was $57 per year. 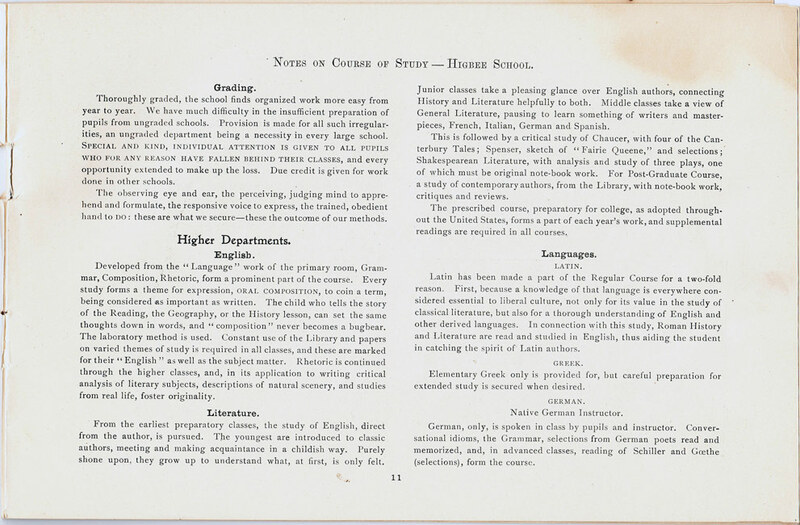 For boarding pupils the charge for tuition in the higher departments, board, and laundry was $268 per year. 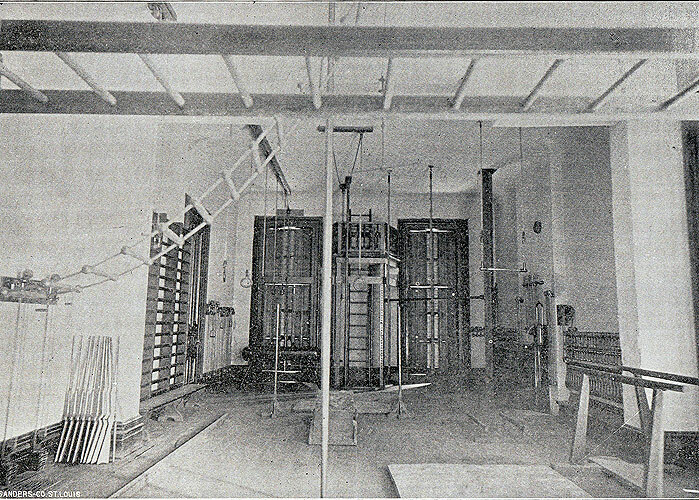 It is extremely rare to find photos from this period which show the interior of buildings. 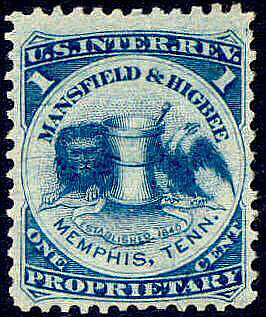 The series of photos (below) are from the collection of Memphis historian George Whitworth who has graciously allowed Historic-Memphis.com to publish them for the first time. 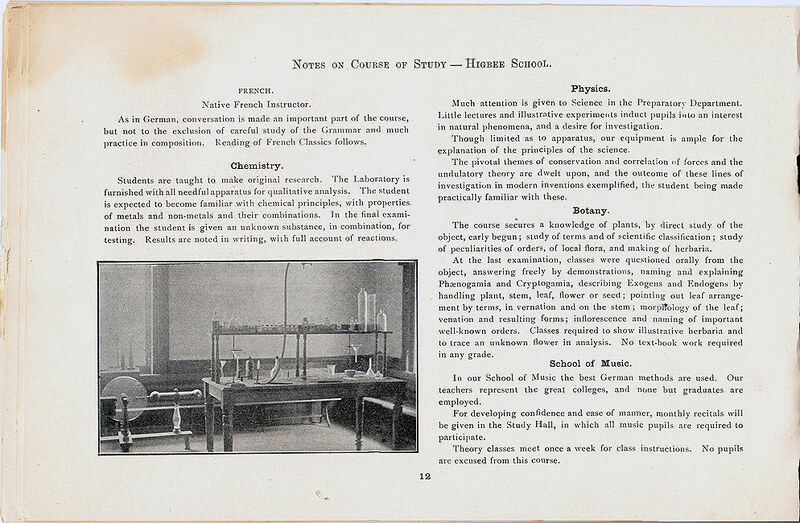 There are photos of the Chemistry Lab, the Gymnasium, the library, and the Study Hall-Theatre. 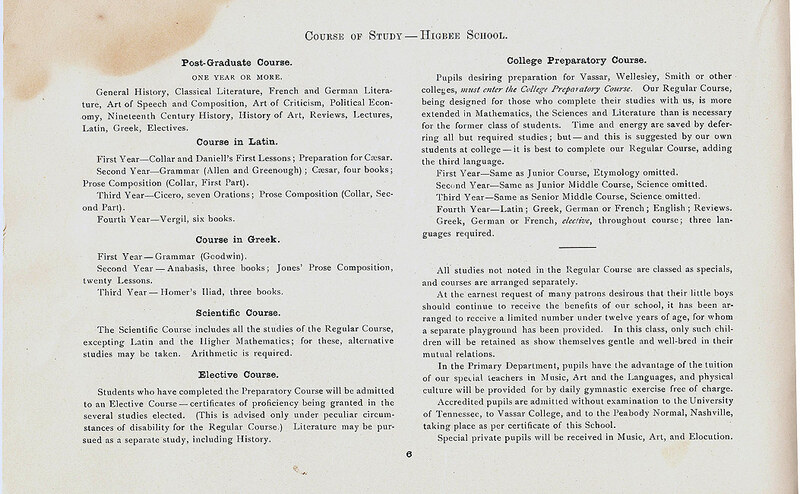 This very rare Higbee School Course of Study is in the collection of George Whitworth. 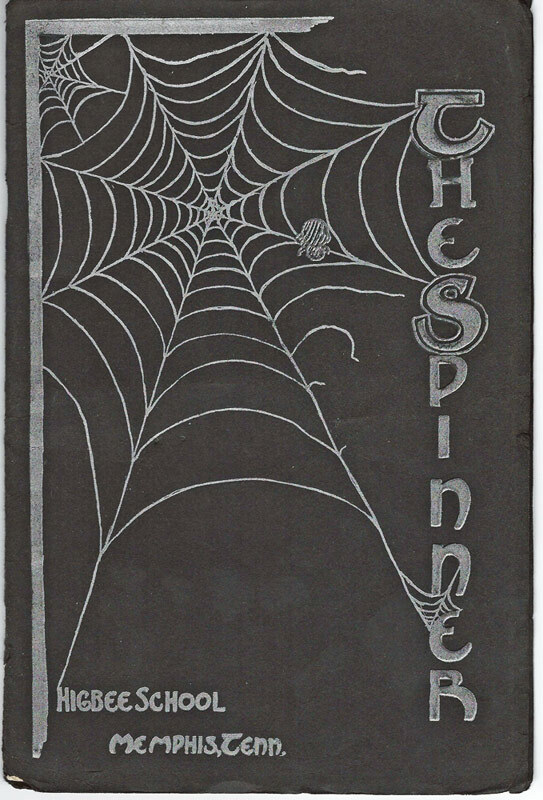 He has allowed us to publish the entire booklet on this web page. 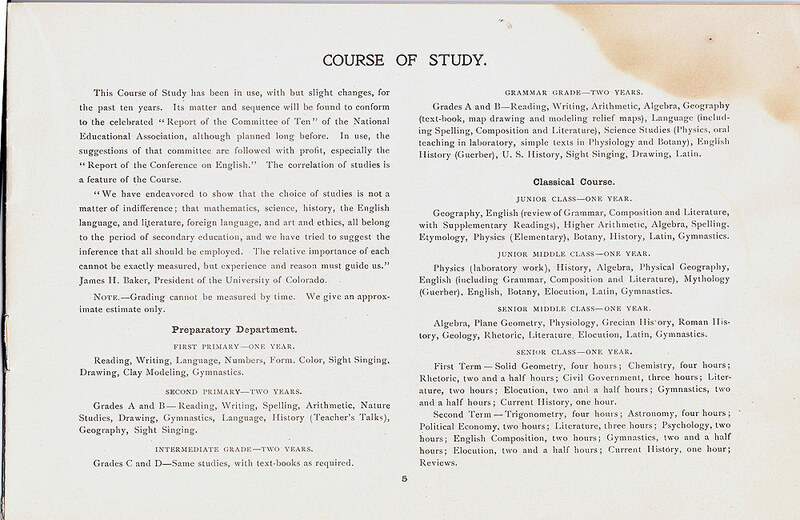 The Course of Study was "not for sissies." It was rough. 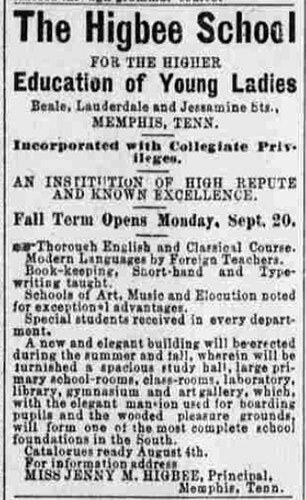 Check it out and you'll understand why Higbee School graduates were automatically allowed entry into Vassar without examination. 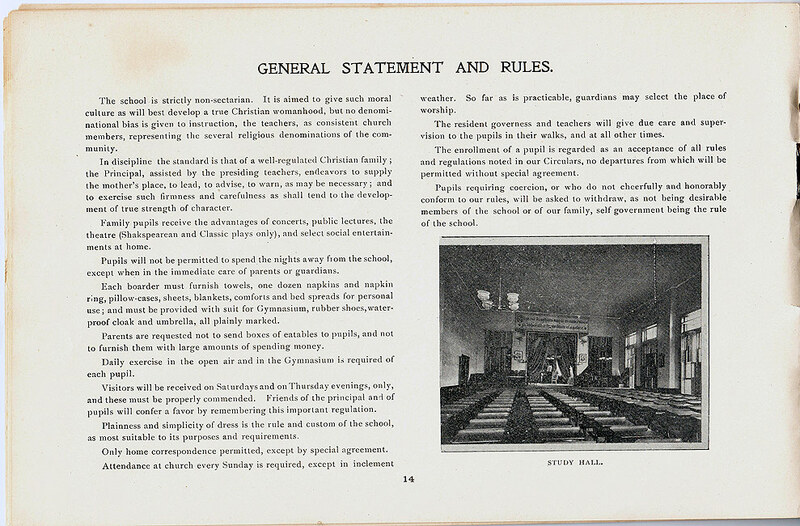 The School's Motto: "That our daughters may be as cornerstones - the polished corners of the temple." 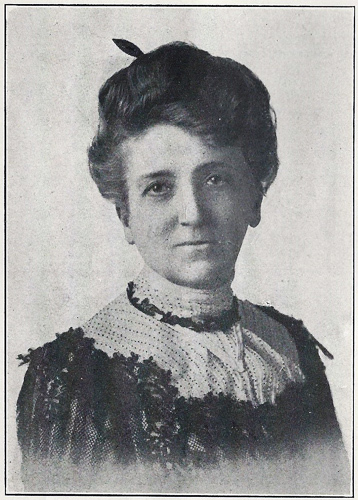 Jenny Higbee's vigorous leadershp and dedication to education were consistently given high praise in numerous articles. 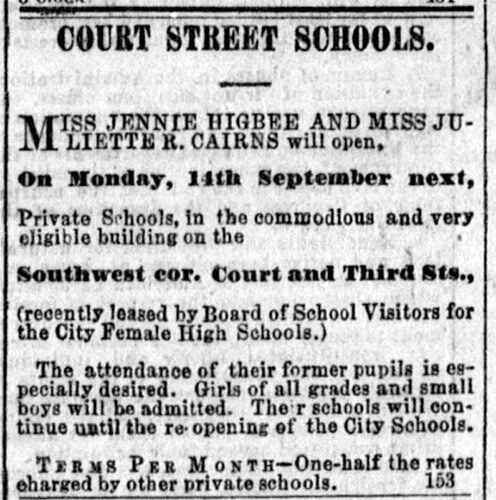 Her public services were " many, noble and freely given" But it had always been in the classroom where Miss Jenny was a star. 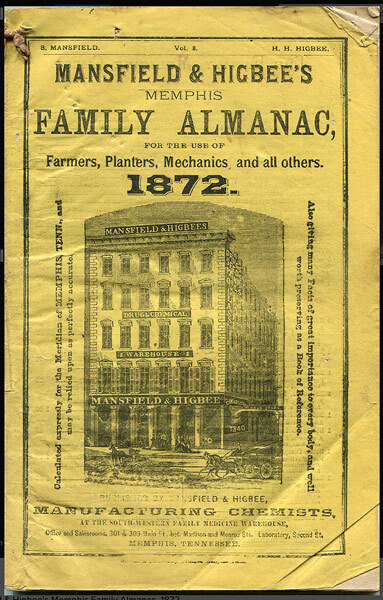 There, "her full strength manifested itself . 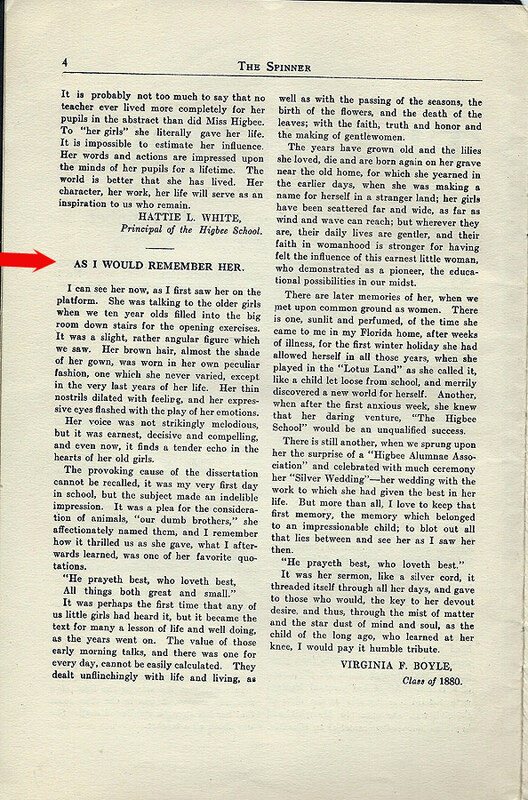 She was above all, a teacher". 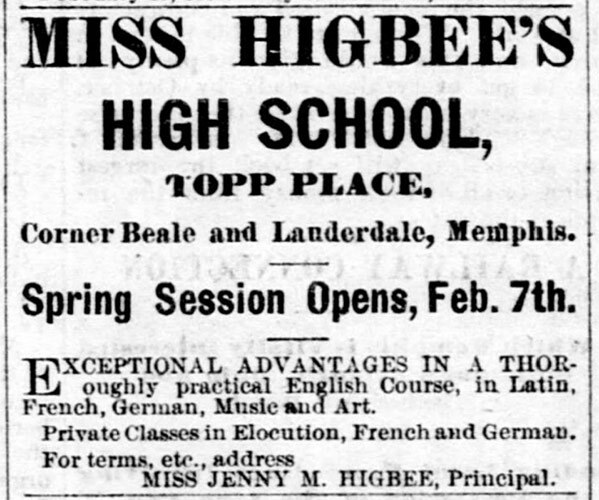 .Her school on Beale Street continued to enjoy great respect as long as she lived and until it closed 11 years after her death..
1887 Higbee Ad 1889 Invitation "Educational Equity - 1997"
Jenny M. Higbee passed away in 1903 and her school survived without her until 1914. 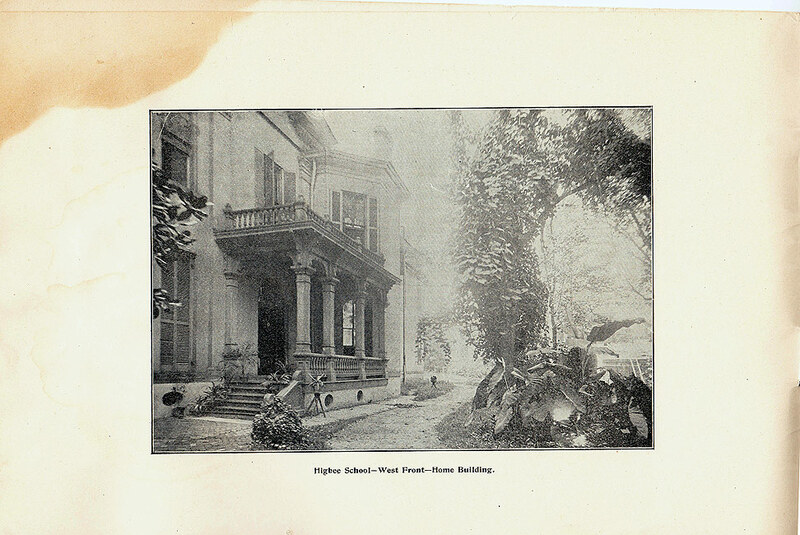 Many sources report that it closed in 1910, but new information has confirmed that two of her teachers, Hattie L. White and Mary E. Pimm, kept it going until 1914. 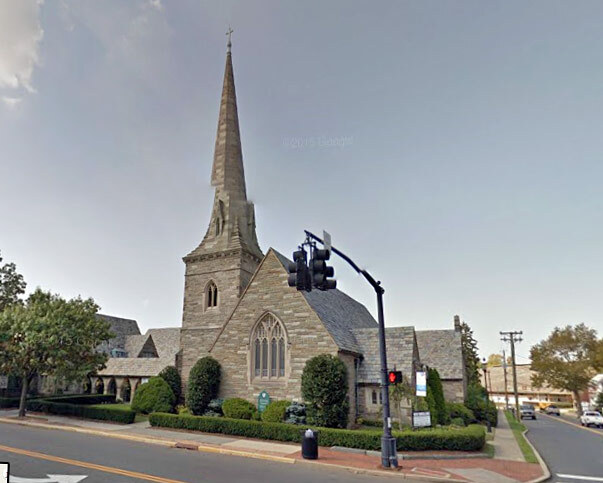 Jenny is buried in Moorestown, New Jersey at Trinity Episcopal Church cemetery. 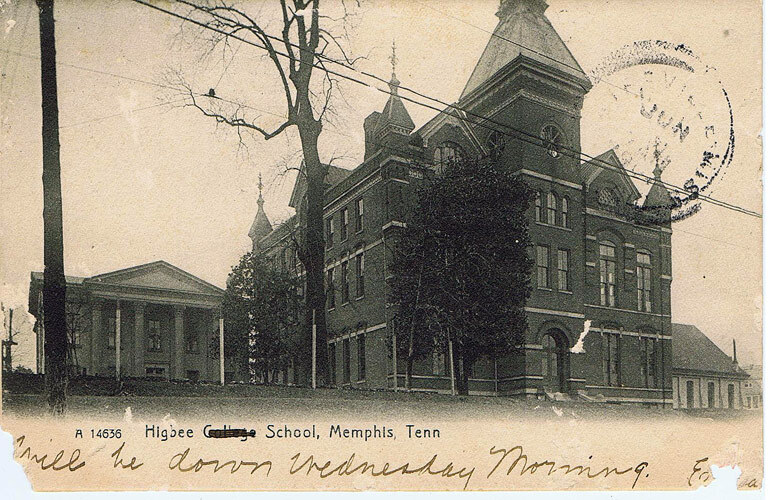 The Memphis Trades and Labor Council purchased the Higbee School property in 1921 and remodeled the building for their headquarters. 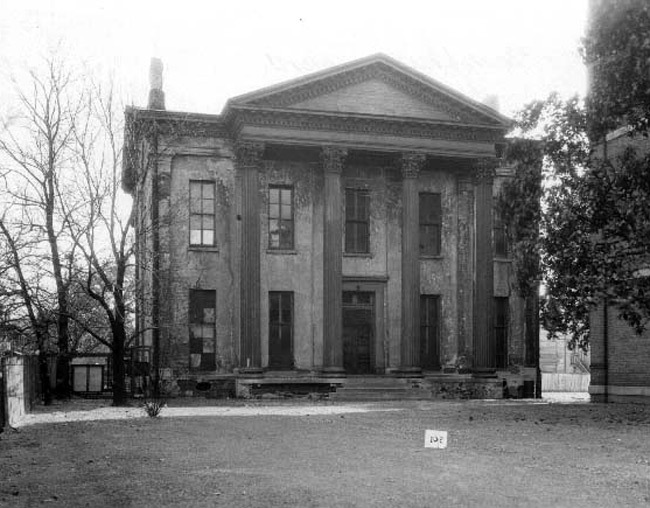 They demolished the Topp Mansion in the 1930s and the Higbee School in 1972. 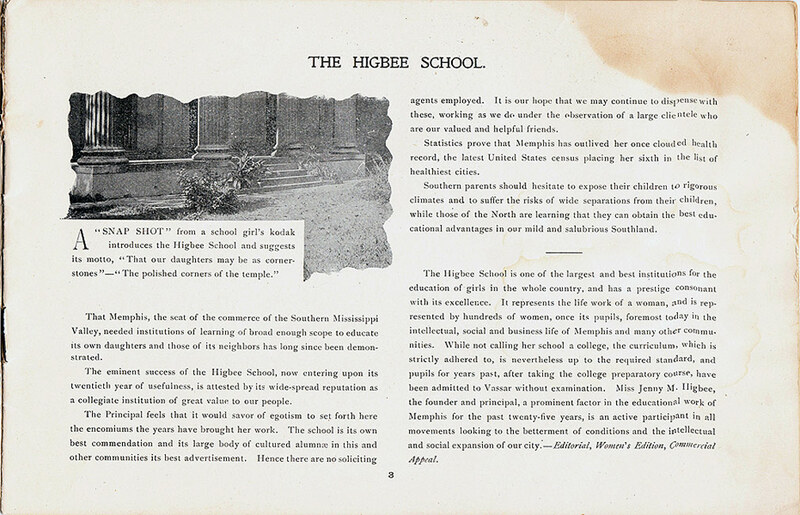 There is a memorial dedicated to Miss Higbee in Overton Park and Higbee Avenue is also named for her. 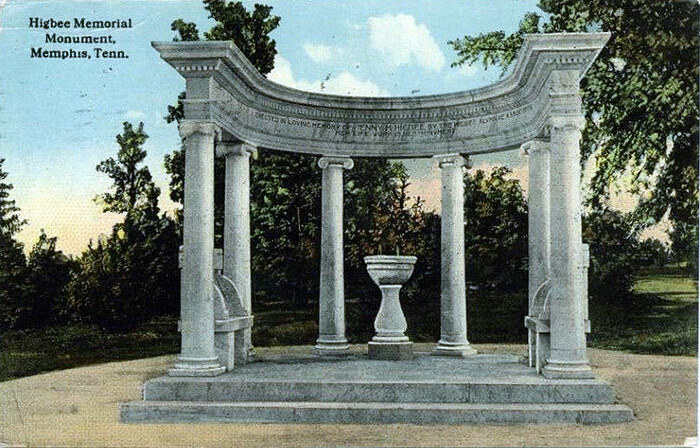 The Overton park memorial is made up of six marble Ionic columns forming a semi-circle surrounding a drinking fountain. 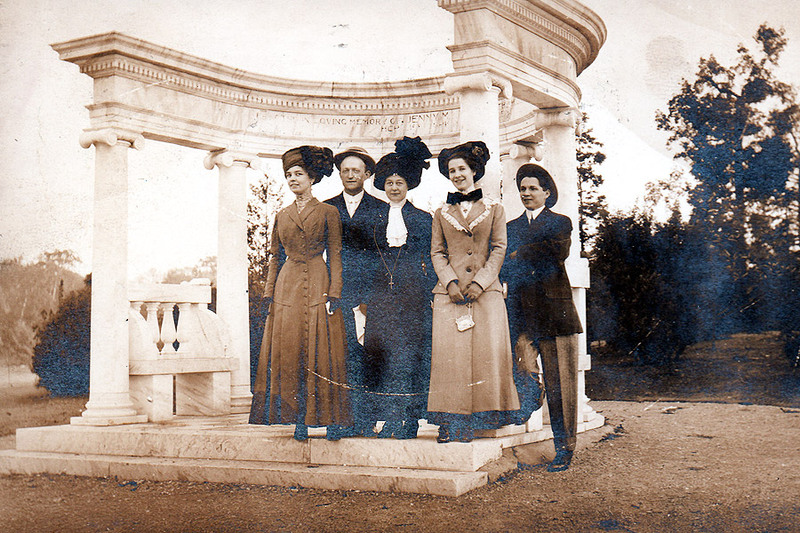 Built in 1908 it is the oldest memorial in the park. 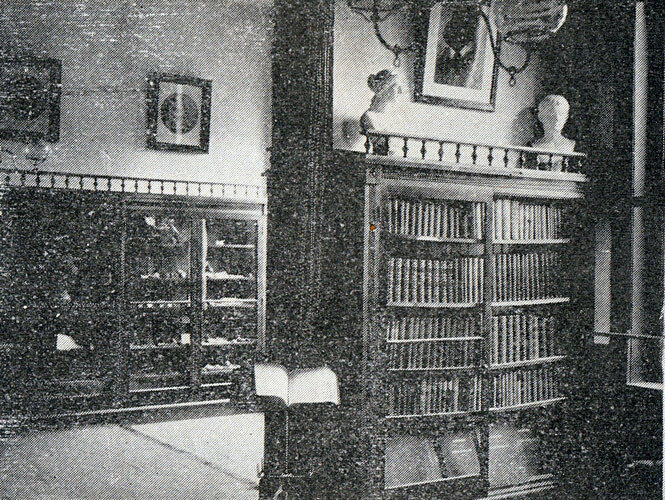 The inscription reads "Her Life's Work is her Monument". 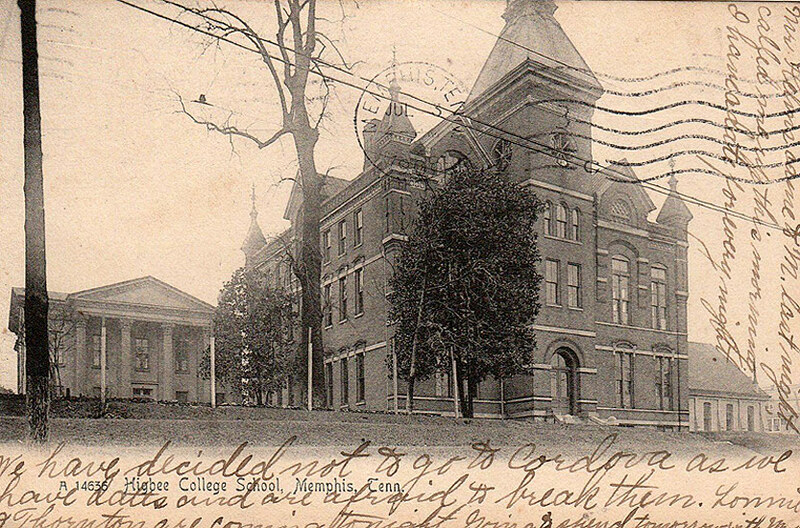 The money for the memorial was raised by Alumni of the Higbee School. 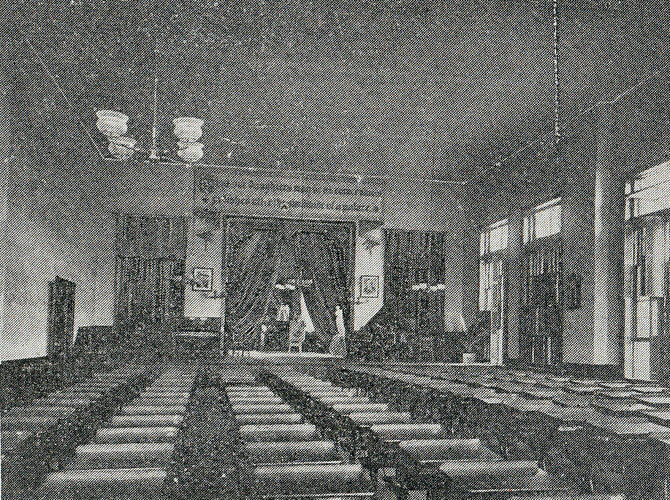 The monument originally had two seats but they have now been removed. 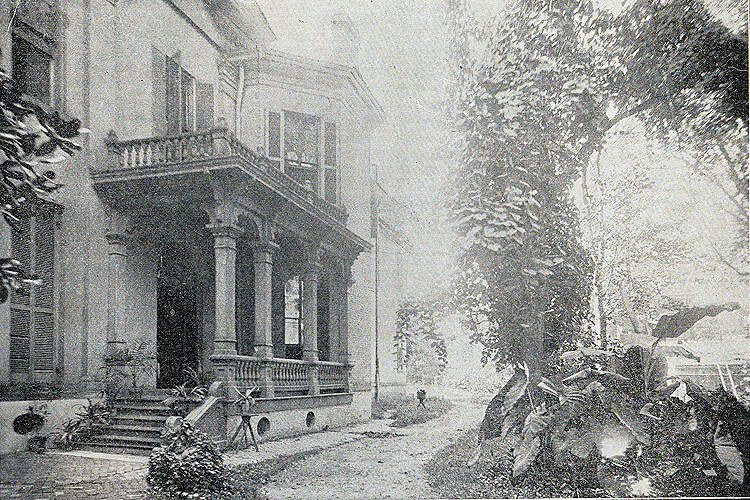 Although not a founding member, Jenny Higbee was among the Nineteenth Century Club's earliest members and would have associated with the social elite of Memphis. 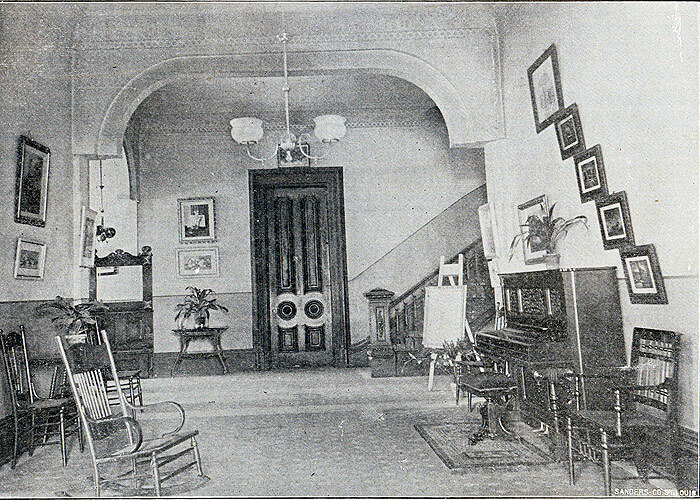 The club was founded by a group of elite white women at the Gayoso Hotel in 1890 and would soon become the largest and most influential women's club in Memphis. 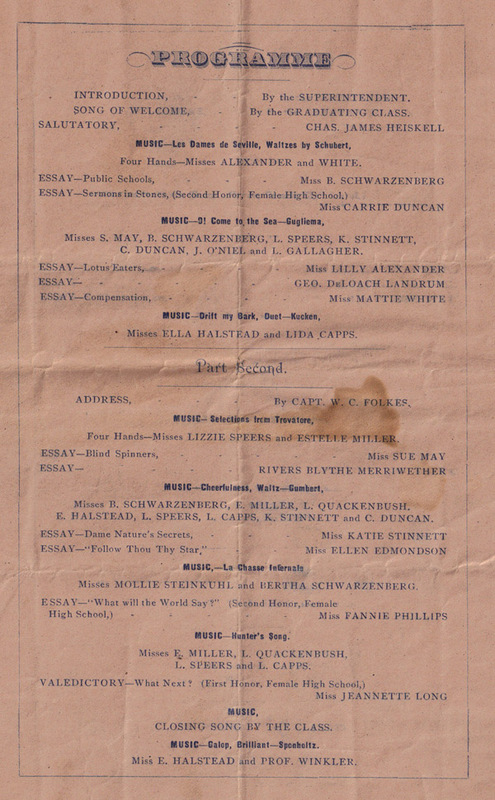 Their objectives were "to promote the female intellect by encouraging a spirit of research in literary fields and provide an intellectual center for the women of Memphis." Their motto is "Influence is Responsibility. As of 2014 the club is disbanding. 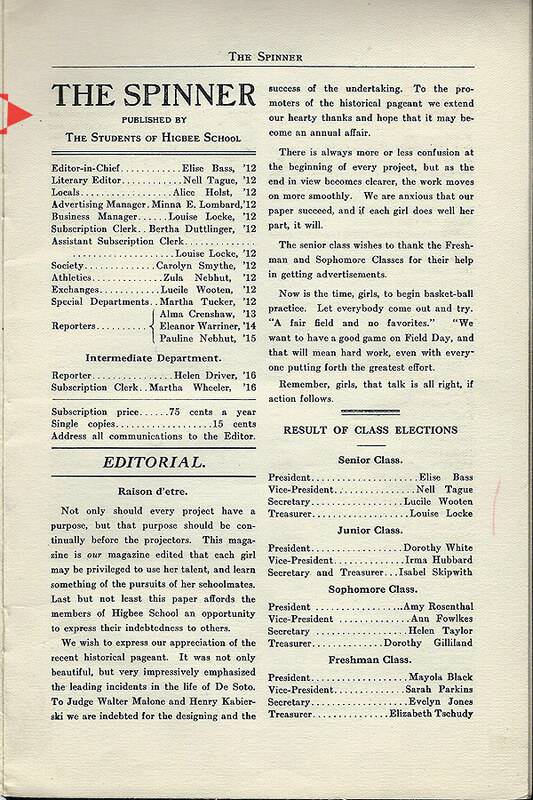 ... and Robertson Topp ? ... Jennie or Jenny Higbee? 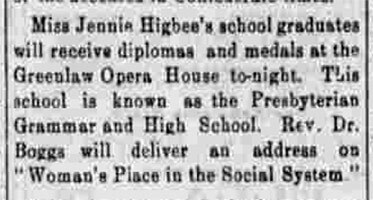 In various articles, Higbee's name is spelled "Jennie" and "Jenny". 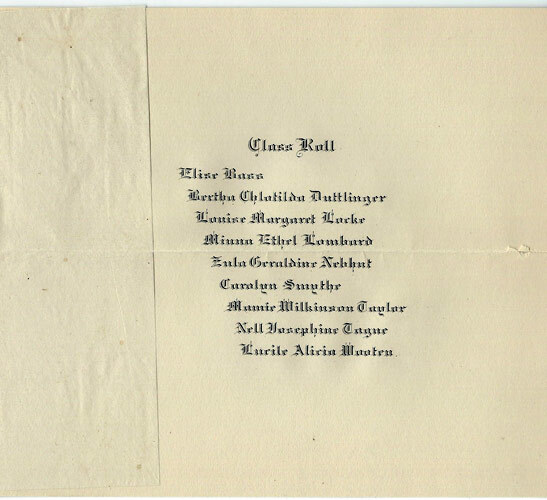 There appears to be no official document with the correct spelling of her name. 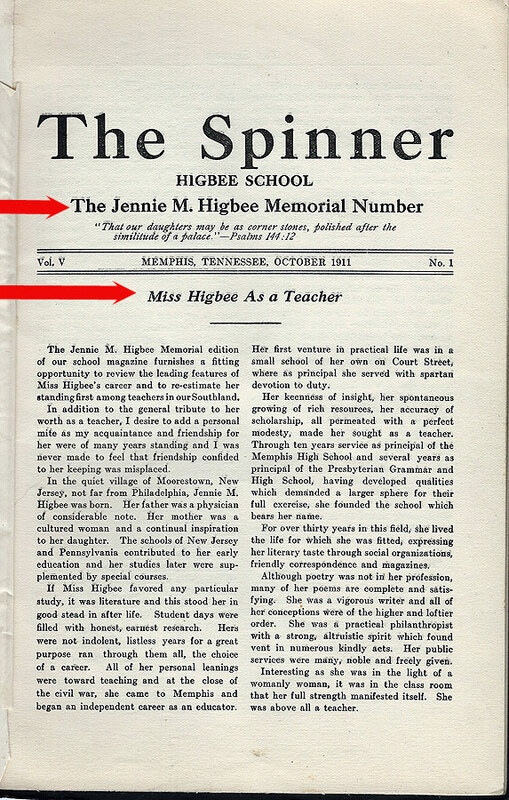 We have adopted the "Jenny" spelling, because her name is spelled that way on the Overton Park Monument, and that's the spelling used on a number of educational journals. 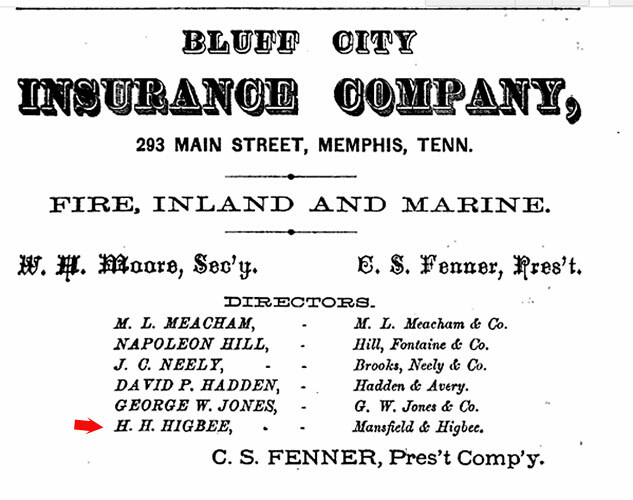 ... and is H. H. Higbee the brother of Jenny Higbee? 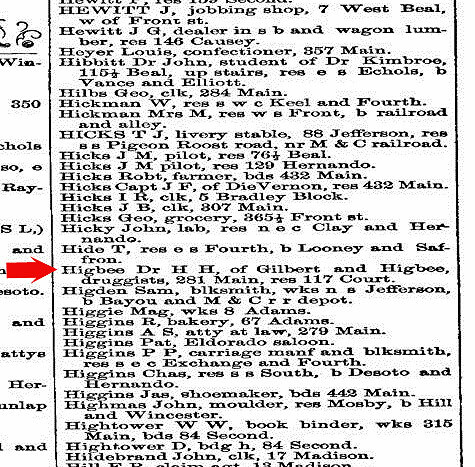 During research for this page, we kept finding the name "H. H. Higbee" - with almost no real information about him. 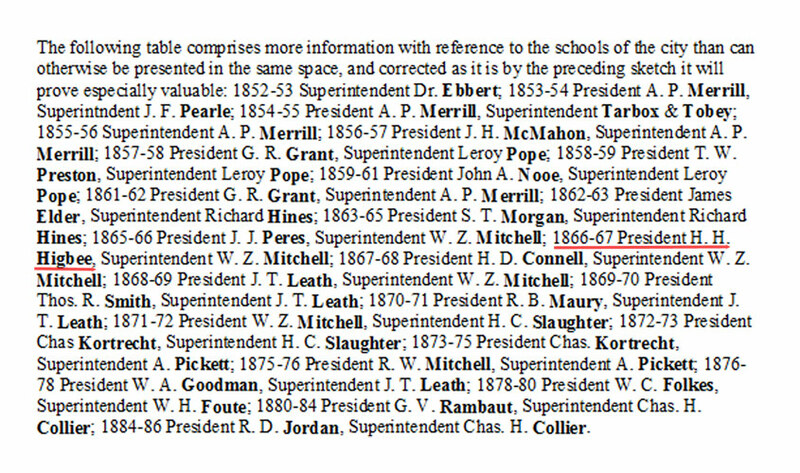 His name appears in many articles as well as being listed on many committees in the city from 1866 to the 1870s. 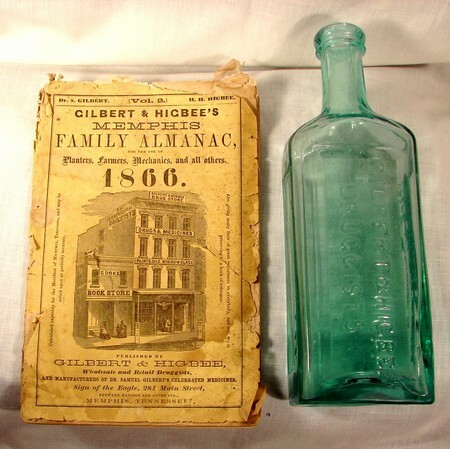 He was a druggist and possibly a doctor and was partners in the firms of Gilbert & Higbee Drugstore, and later Mansfield & Higbee Drugs. 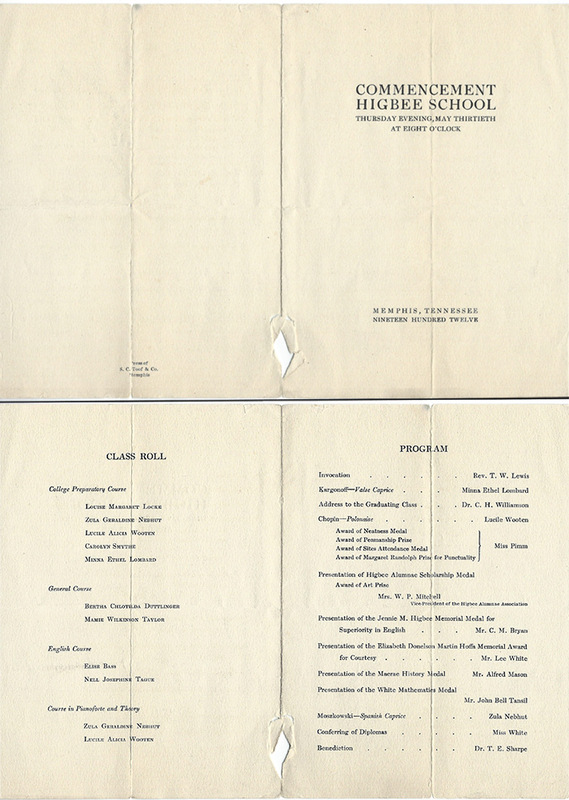 Both are confirmed below. 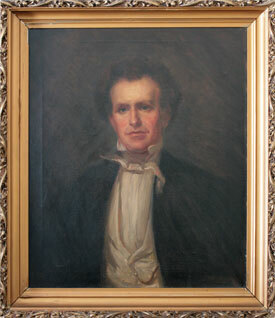 The first "H" in his name might stand for "Hugh". 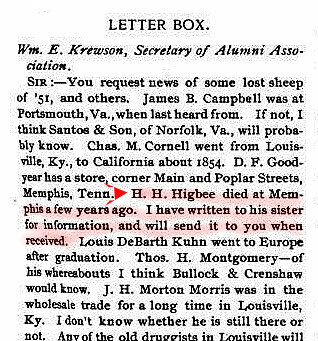 We think he is the brother that Jenny came to Memphis to live with, but the only close connection with Jenny is that H. H. Higbee was President of the School Board in 1866. 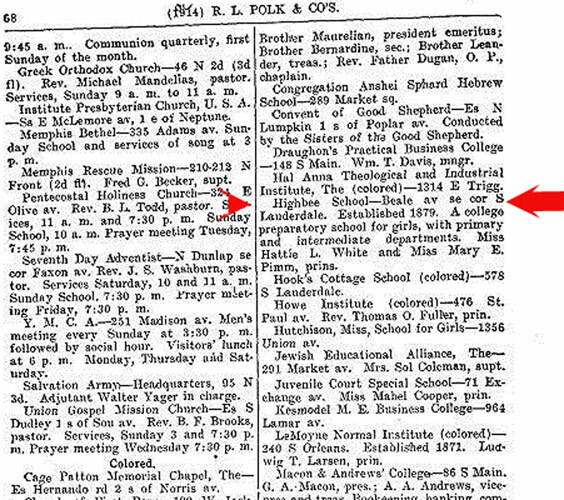 Once again the Memphis directories on the Shelby Country Registry website have proved to be an invaluable source of information. 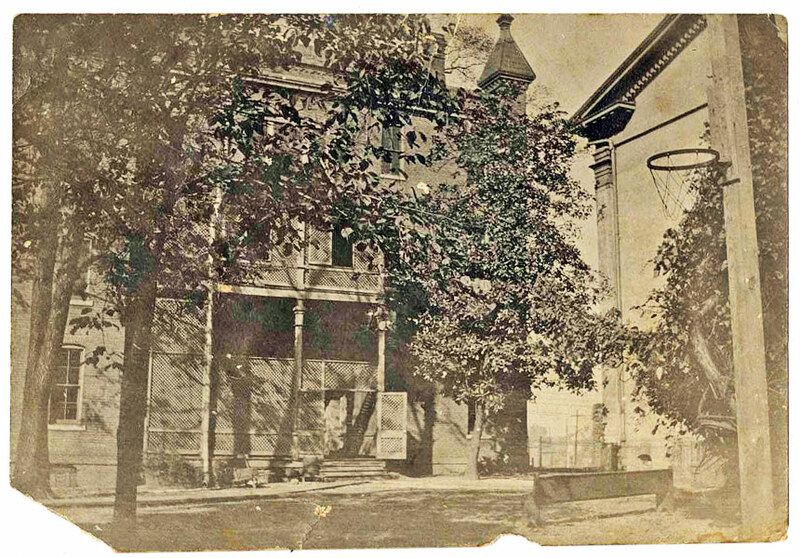 Hugh H. Higbee and Jenny Higbee were brother and sister and they both lived at 117 Court from 1866 to 1874. 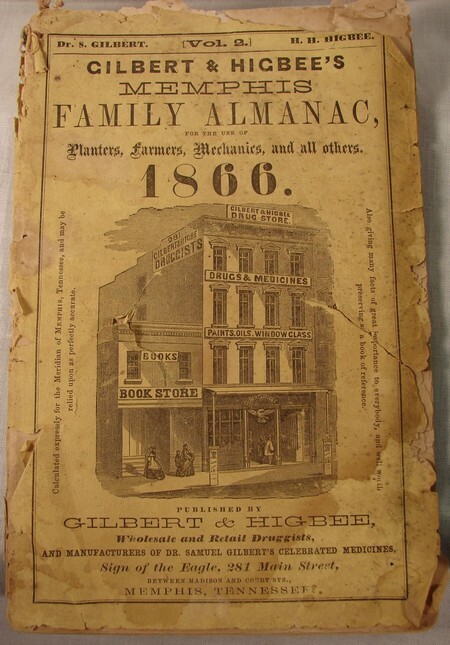 And her brother was a "doctor", a graduate of the Philadelphia College of Pharmacy in 1856. 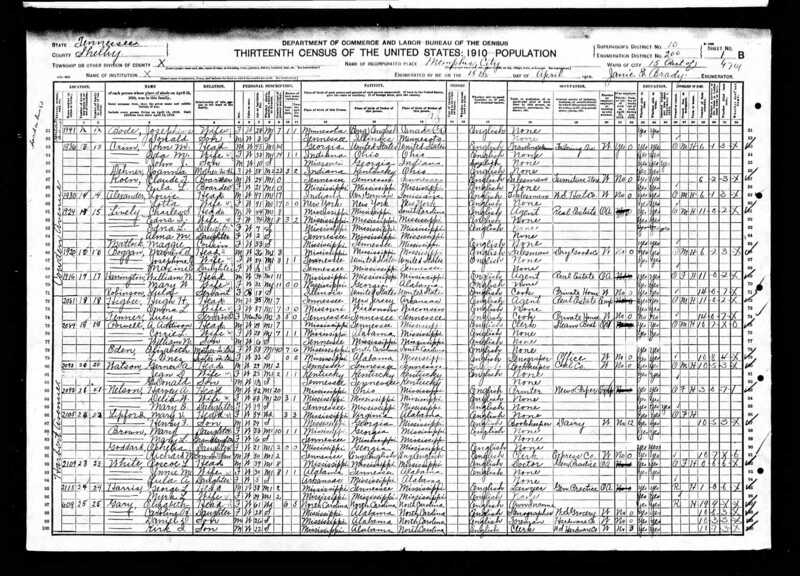 The 1910 census shows that Hugh H. Higbee, born in New Jersey, is married to EMMA Higbee. 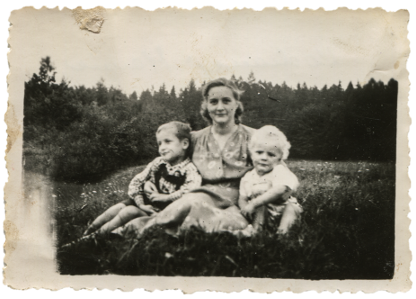 A photo of EMMA Higbee with two children (Unnamed) has been located.